Moose Madness 2 is divided into seven sections. 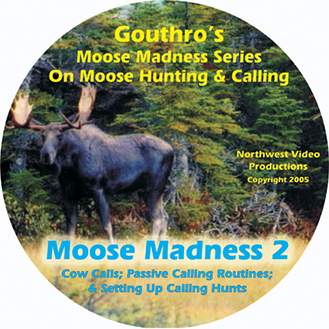 This DVD first teaches the passive routines used by the experts when calling moose - where the caller mimics the cow moose in heat, on land, in the water, and when calling. The in-depth calling instruction is followed by a detailed look at how to set up and execute calling moose hunts, using passive routines when hunting on lakes or other open areas such as marshes or woodcuts. The ‘Tips’, such as on the use of ‘Silent Communications’, are designed to help hunters better prepare for the hunt, improve hunt setups, and reduce the chance of error when conducting the actual hunts.